The hadal zone (named after the realm of Hades, the underworld in Greek mythology), also known as the hadopelagic zone, is the deepest region of the ocean lying within oceanic trenches. The hadal zone is found from a depth of around 6,000 to 11,000 metres (20,000 to 36,000 ft), and exists in long but narrow topographic V-shaped depressions. The cumulative area occupied by the 46 individual hadal habitats worldwide is less than 0.25 percent of the world's seafloor, yet trenches account for over 40 percent of the ocean's depth range. Most hadal habitat is found in the Pacific Ocean. Historically the hadal zone was not recognized as distinct from the abyssal zone, although the deepest sections were sometimes called "ultra-abyssal". During the early 1950s, the Danish Galathea II and Russian Vitjaz expeditions separately discovered a distinct shift in the life at depths of 6,000–7,000 m (20,000–23,000 ft), not recognized by the broad definition of the abyssal zone. The term "hadal" was first proposed in 1956 by Anton Frederik Bruun to describe the parts of the ocean deeper than 6,000 m (20,000 ft), leaving abyssal for the parts at 4,000–6,000 m (13,000–20,000 ft). The name refers to Hades, the ancient Greek god of the underworld. Depths in excess of 6,000 m (20,000 ft) are generally in ocean trenches, but there are also trenches at shallower depths. These shallower trenches lack the distinct shift in lifeforms and are therefore not hadal. Although the hadal zone has gained widespread recognition and many continue to use the first proposed limit of 6,000 m (20,000 ft), it has been observed that 6,000–7,000 m (20,000–23,000 ft) represents a gradual transition between the abyssal and hadal zones, leading to the suggestion of placing the limit in the middle, at 6,500 m (21,300 ft). Among others, this intermediate limit has been adopted by UNESCO. Similar to other depth ranges, the fauna of the hadal zone can be broadly placed into two groups: the hadobenthic species (compare benthic) living on or at the seabottom/sides of trenches and the hadopelagic species (compare pelagic) living in the open water. Marine life decreases with depth, both in abundance and biomass, but there is a wide range of metazoan organisms in the hadal zone, mostly benthos, including fish, sea cucumber, bristle worms, bivalves, isopods, sea anemones, amphipods, and gastropods. Most of these trench communities probably originated from the abyssal plains. Although they have evolved adaptations to high pressure and low temperatures such as lower metabolism, intra-cellular protein-stabilising osmolytes, and unsaturated fatty acids in cell membrane phospholipids, there is no consistent relationship between pressure and metabolic rate in these communities. Increased pressure can instead constrain the ontogenic or larval stages of organisms. Pressure increases 10-fold as an organism moves from sea level to a depth of 90 m (300 ft), whilst pressure only doubles as an organism moves from 6,000 to 11,000 m (20,000 to 36,000 ft). Over a geological time scale, trenches can become accessible as previously stenobathic (limited to a narrow depth range) fauna evolve to become eurybathic (adapted to a wider range of depths), such as grenadiers and natantian prawns. Trench communities do, nevertheless, display a contrasting degree of intra-trench endemism and inter-trench similarities at a higher taxonomic level. Only a relatively small number of fish species are known from the hadal zone, including certain grenadiers, cutthroat eels, pearlfish, cusk-eels, snailfish and eelpouts. Due to the extreme pressure, the theoretical maximum depth for vertebral fish may be about 8,000–8,500 m (26,200–27,900 ft), below which teleosts would be hyperosmotic, assuming TMAO requirements follow the observed approximate linear relationship with depth. Some invertebrates (simpler organisms than the vertebrate fish) do occur deeper, such as certain Astrorhizana foraminifera, polynoid worms, myriotrochid sea cucumbers, turrid snails and pardaliscid amphipods in excess of 10,000 m (33,000 ft). Most life at this depth is sustained by marine snow or the chemical reactions around thermal vents, and by metabolization of hydrogen and methane released by rock and seawater reactions (serpentinization). The low nutrient level, extreme pressure and lack of sunlight create hostile living conditions in which few species are able to exist. The hadal zone can reach far below 6,000 m (20,000 ft) deep; the deepest known extends to 10,911 m (35,797 ft). At such depths the pressure in the hadal zone exceeds 1,100 standard atmospheres (110 MPa; 16,000 psi). Lack of light and extreme pressure makes this part of the ocean difficult to explore. The exploration of the hadal zone requires the use of instruments that are able to withstand pressures of several hundred up to a thousand or more atmospheres. Grabs, trawls, and traps have been used to collect samples of hadal organisms and sediments, however these instruments cannot be used to systematically study hadal ecology. 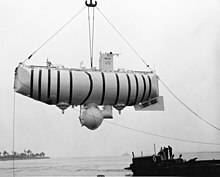 In comparison, manned and unmanned submersibles can be used to study the depths in greater detail. Unmanned robotic submersibles may be remotely operated (connected to the research vessel by a cable) or autonomous (freely moving). Cameras and manipulators on submersibles allow researchers to observe and take samples of sediment and organisms. Failure of submersibles under the immense pressure at hadal zone depths have occurred. HROV Nereus was thought to have imploded at a depth of 9,990 meters while exploring the Kermadec Trench in 2014. The first manned exploration to reach Challenger Deep, the deepest known part of the ocean located in the Mariana Trench, was accomplished in 1960 by Jacques Piccard and Don Walsh. They reached a maximum depth of 10,911 meters in the bathyscaphe Trieste. James Cameron also reached the bottom of Mariana Trench in March 2012 using the Deepsea Challenger. The descent of the Deepsea Challenger was unable to break the deepest dive record set by Piccard and Walsh by about 100 meters, however Cameron holds the record for the deepest solo dive. In June 2012, the Chinese manned submersible Jiaolong was able to reach 7,020 meters deep in the Mariana Trench, making it the deepest diving manned research submersible. This range surpasses that of the previous record holder, the Japanese-made Shinkai, whose maximum depth is 6,500 meters. Few unmanned submersibles are capable of descending to maximum hadal depths. The deepest diving unmanned submersibles have included the Kaikō (lost at sea in 2003), the ABISMO, the Nereus (lost at sea in 2014), and the Haidou-1. ^ Alan Jamieson (13 February 2017). "Bioaccumulation of persistent organic pollutants in the deepest ocean fauna". nature.com. ^ Alan Jamieson (5 March 2016). "Hadal zone: Ten things you never knew about the ocean's deepest places". International Business Times. ^ a b Alan Jamieson (29 April 2014). "All About Trenches". HADES – HADal Ecosystem Studies. ^ Wolff, T. (1959). "The hadal community, an introduction". Deep Sea Research. 6: 95–124. doi:10.1016/0146-6313(59)90063-2. ^ a b Jamieson, A. J.; Fujii, T.; Mayor, D. J.; Solan, M.; Priede, I. G. (2010). "Hadal trenches: the ecology of the deepest places on Earth (Review article)" (PDF). Trends in Ecology and Evolution. 25 (3): 190–197. doi:10.1016/j.tree.2009.09.009. Retrieved 9 April 2017. ^ a b Bruun, A.F. (1956). "The abyssal fauna: its ecology, distribution and origin". Nature. 177: 1105–1108. doi:10.1038/1771105a0. ^ United Nations (2017). The First Global Integrated Marine Assessment, World Oceans Assessment I. Cambridge University Press. p. 904. ISBN 978-1-316-51001-8. ^ a b Jamieson, A. (2015). The Hadal Zone: Life in the Deepest Oceans. Cambridge University Press. pp. 18–21, 285–318. ISBN 978-1-107-01674-3. ^ a b Jamieson, A. (2011). Ecology of Deep Oceans: Hadal Trenches. John Wiley & Sons, Ltd. doi:10.1002/9780470015902.a0023606. ^ Roff, J.; M. Zacharias (2011). Marine Conservation Ecology. Earthscan. ISBN 978-1-84407-884-4. ^ Vierros, M.; I. Cresswell; E.E. Briones; J. Rice; J. Ardron (2009). Global Open Oceans and Deep Seabed (GOODS) - Biogeographic Classification (PDF). UNESCO, Paris. Retrieved 23 December 2017. ^ Thorne-Miller, B. (1999). The Living Ocean: Understanding and Protecting Marine Biodiversity. John Wiley & Sons, Ltd. p. 57. ISBN 1-55963-678-5. ^ Meadows, P.S. ; J.I. Campbell. (1988). An Introduction to Marine Science. Island Press. p. 7. ISBN 978-0-7514-0141-7. ^ Jamieson, A.J. ; P.H. Yancey (2012). "On the Validity of the Trieste Flatfish: Dispelling the Myth". The Biological Bulletin. 222 (3): 171–175. doi:10.1086/BBLv222n3p171. ^ Yanceya, P.H. ; E.M. Gerringera; J.C. Drazen; A.A. Rowden; A. Jamieson (2014). "Marine fish may be biochemically constrained from inhabiting the deepest ocean depths". PNAS. 111 (12): 4461–4465. doi:10.1073/pnas.1322003111. PMC 3970477. ^ "NOAA Ocean Explorer: History: Quotations: Soundings, Sea-Bottom, and Geophysics". NOAA, Office of Ocean Exploration and Research. Retrieved 2010-03-23. ^ a b "About Hades :: HADES". web.whoi.edu. Retrieved 2018-04-06. ^ a b "Robotic Deep-sea Vehicle Lost on Dive to 6-Mile Depth". Woods Hole Oceanographic Institution. Retrieved 2018-04-06. ^ ThinkQuest Archived 2007-01-28 at the Wayback Machine. February 1, 2007. ^ a b "1960: Deepest Manned Ocean Descent". Guinness World Records. 2015-08-19. Retrieved 2018-04-06. ^ Than, Ker (March 25, 2012). "James Cameron Completes Record-Breaking Mariana Trench Dive". National Geographic Society. ^ "Jiaolong Reaches 7.000 Meters Below Water". Subsea World News. Retrieved 2018-04-06. ^ Owens, Brian (25 Jun 2012). "China's Jiaolong submersible plunges below 7,000 metres : News blog". blogs.nature.com. Retrieved 2018-04-06. ^ "SHINKAI 6500 < Research Vessels and Vehicles < Research Vessels, Facilities and Equipment < About JAMSTEC < JAMSTEC". www.jamstec.go.jp. Retrieved 2018-04-06. ^ "KAIKO < Research Vessels and Vehicles < Research Vessels, Facilities and Equipment < About JAMSTEC < JAMSTEC". www.jamstec.go.jp. Retrieved 2018-04-06. ^ "Press Releases < About JAMSTEC < JAMSTEC". www.jamstec.go.jp. Retrieved 2018-04-06. ^ "China to build sub to touch deepest point in ocean by 2020". Mail Online. 23 January 2018. Retrieved 2018-04-06. This page was last edited on 8 April 2019, at 07:02 (UTC).